The New Order of Highsec asserted its claim over the Uotila system earlier this month. Most of the Uotila miners were ignorant, but at least one had heard troubling things about us from his friends in Kamio. A few days later, while I was bumping some disobedient Uotila residents, the system received a visitor from Kamio. brichardi, a self-described opponent of the New Order, came to threaten my authority. 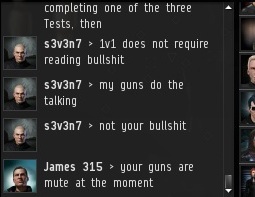 This consisted of whining about the fact that I am in an NPC corp and cannot be wardecced. brichardi also complained about my "secret police", referring to Agents of the New Order--specifically, the Arctic Dungeon corporation. brichardi announced her intention to engage me in a 1v1 duel. Since I am a very important figure in EVE, I often receive such requests. As Sun Tzu said, there is no honour in defeating an unworthy opponent, so I asked for a confirmation that she had honour. Her corpmate, s3v3n7, who accompanied her, insisted that the corp did have honour. 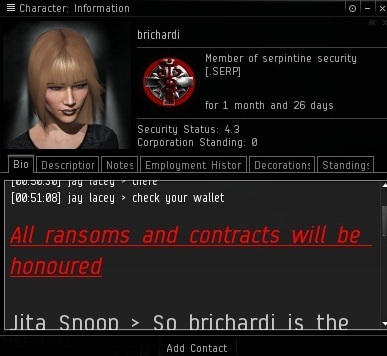 brichardi claimed that she always honoured 1v1 duels, as opposed to using them as an opportunity to have her whole corp ambush the target, as is customary in EVE. Her story checked out: Her bio confirmed that she always honoured agreements. Now it was time to see if words were matched by deeds. I pointed brichardi to the provision in the Code that sets forth the instructions on how to qualify for a 1v1 duel. 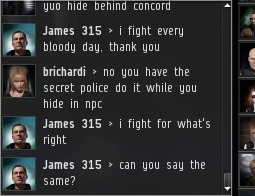 s3v3n7, playing the role of "me too" to brichardi's "big dog", yipped at me. 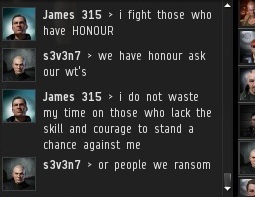 I was unsure of what role he was supposed to play in the 1v1 duel, aside from cheering on his corpmate. In frustration, brichardi fitted out her combat ship, the ever-popular Caldari Navy Hookbill, and laid down the gauntlet by ejecting a can of her own next to my warning containers. Nevertheless, it is the Supreme Protector who determines the rules, not every young gun with an ego who rolls into my systems. I asked s3v3n7 what his own purpose was, and he explained that he was guarding one of the stargates in case I tried to escape. At long last, brichardi decided she needed to play by the rules, so she invoked one of the three Tests. ...Or at least, she attempted to do so. s3v3n7 yipped some more while brichardi returned to the website to refresh her memory of the Tests. Now we were getting somewhere. The Test of Wisdom was officially invoked. It was so on. The first of the Questions Three is always the easiest, and is often reused in different 1v1's. 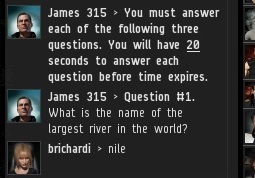 brichardi confidently asserted that the Nile River is the largest river in the world. Sadly, she was wrong. The Nile may be the longest river, but not the largest--not even close. Thus ended the day's combat. brichardi quietly slipped out of the system. 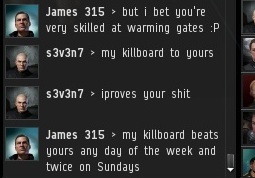 s3v3n7, chastened at the sight of his superior's downfall, did not bother to offer his own 1v1 challenge. The Supreme Protector of Uotila remained undefeated. This is better than Dexter and Fringe combined! What... is your favorite colour?